A raging forest fire races up a steep canyon, and ground crews scramble to outrun the oncoming inferno. 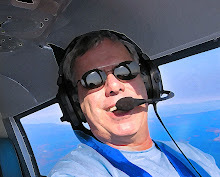 They retreat, and the Captain picks up the radio and calls for some MAJOR backup from the air. In minutes, a dark silhouette of a very large aircraft appears on the horizon, flying low but not slow. When the jet’s position is perfect, the Air Boss makes the call and in a blink of an eye, 20,000 gallons of fire retardant rain down from the sky, beating back the fire to give the firefighters room to work. This scenario is coming to a forest fire near you very soon, thanks to Evergreen Aviation, located right up the road from me in McMinnville, Oregon. The aircraft is the Supertanker, a highly-modified Boeing 747-200. Yes, you read that right, a jumbo jet firebomber. The multi-role 747 Supertanker is the largest tanker aircraft available today. It has more than seven times the drop capability of a P3, and its patent-pending pressurized system has the capability to disperse retardant at high pressure for an overwhelming response, or drop retardant at the speed of falling rain in single or several segmented drops. Evergreen is taking the Supertanker “on the road” so to speak, visiting 11 states during a month-long, nationwide tour to demonstrate the capabilities of the world’s largest firefighting aircraft to wildland firefighters at the federal, state and local levels. The tour will include coast-to-coast briefings and scheduled water drops at 13 locations, commencing in Phoenix, Ariz. (IWA) and concluding in Anchorage, Alaska (ANC). Details for each demonstration visit are available on Evergreen Aviation’s website. 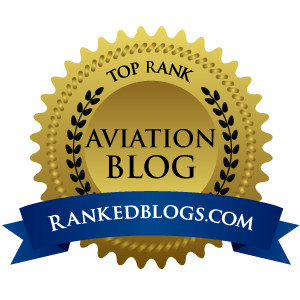 And if you’ve never heard of Evergreen, here’s the 411: Evergreen International Aviation, Inc. is a portfolio of five diverse aviation companies. 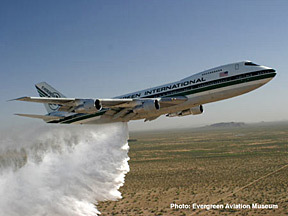 With international operating authority and a network of global offices and affiliates, Evergreen consists of an international cargo airline that owns and operates a fleet of Boeing 747s, an unlimited aircraft maintenance, repair, and overhaul facility, a full-service helicopter company, an aircraft ground handling company, and an aircraft sales and leasing company. In addition to these endeavors, Evergreen owns and operates the not-for-profit Evergreen Aviation Museum, home of the Spruce Goose.